As Innes Sibun explains: "When the chance comes along to play with a great musician who is travelling down the same musical road as you, then you jump at it. Listening to Marcus Malone I hear echo's of two of my favourite singers, Paul Rodgers, Otis Redding and early David Coverdale, but above all it's Marcus's own unmistakable style & delivery." "To say we are moving in the same direction musically is an understatement. Not only does Innes have shades of my favourite guitar players - Jimmy Page, Hendrix and Paul Kossoff - but he also has the soulful approach and the dynamics of BB and Albert King. Put all those influences together and you get the unique style of Innes Sibun." 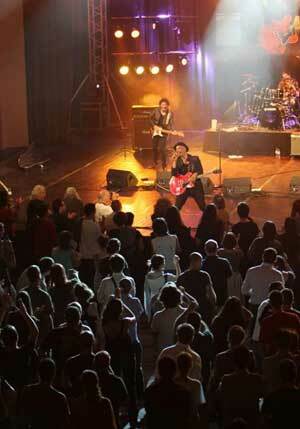 Marcus Malone has just enjoyed the most successful year of his career. His critically acclaimed album 'A Better Man' on Redline records has topped several 'best of the year' polls and he was also nominated as a finalist in the European Blues Awards. The former UA and Motown, Motorcity artist had a diverse hard rock and soul background, before he settled in a blues/rock and direction and relocated to the UK. He played the Albert Hall with BB King and quickly established himself as a top flight blues rocker with a handful of excellent albums , of which his current release is easily his best: "'A Better Man' lives up to its conceptual title as a celebration of everything that makes Marcus one of the most exciting rock/blues bands in Europe." Innes Sibun was barely in his 20's when he was produced by the legendary Mike Vernon, before joining Robert Plant's 'Fate of Nations' world tour. He has subsequently built an international reputation by signing with the American label Viceroy, and then Provogue and Blues Boulevard in Europe. He subsequently became a pivotal member of Sari Schorr & The Engine Room, with whom he cut the acclaimed 'A Force of Nature' album. He's an explosive, but feel player, versatile enough to be able to slip from rock and blues into jazz and funk. Marcus has been nominated by the UK Blues Awards 2018 for Best Male Vocalist and by EU Blues awards for Best Vocalist and Best Album ‘A Better Man’ 2017. Marcus was no 5 most played artist 2017 UK IBBA charts. Together the two stellar musicians promise a powerful mix of rock, blues, soul and funk, all underpinned by Malone's soulful song driven quality and triggered by Sibun's high levels of intensity and his inherent melodic feel. It's an exciting musical partnership born of the same musical influences, but one that offers them a broader canvas than before. Innes concludes: "I'm influenced by a melting pot of blues, rock and soul. And Marcus's songs have that sweet blend of all three of those styles, which at times reminding me of Free, Thin Lizzy and lots of Stax influences." Marcus agrees: "My writing draws on classic rock to blues rock - and even a bit of 60’s West Coast - so Innes 'suits me to a T', as we say in Detroit. Whatever I throw his way I'm sure he will compliment with his guitar style and vice versa." The band has already pencilled in some summer festival dates and the duo are looking forward to honing a promising song writing collaboration. Meanwhile there's the little matter of two inaugural shows that could well see sparks fly. Movinmusic is taking offers for both the Marcus Malone Band and for the new outfit, the Malone Sibun Band, that features both Marcus Malone and Innes Sibun. Interested venue owners promoters can contact us about his availability via e-mail or 0044 (0)1209 860067.